TESL Canada is the national accrediting body for TESOL, TEFL, and TESL courses in Canada. They are an externally accrediting organization that sets the standards for English teacher training and certification. They recognize teacher training programs offered by colleges, universities, language schools, and major institutes such as Coventry House International-OnTESOL. Is TESL Canada Accepted Worldwide? Yes, TESL Canada is accepted everywhere in the world. You can use your TESL Canada certificate to teach English in a foreign country or at home. If your plan is to teach English abroad and have an internationally recognized credential to continue your career when you return home, then TESL Canada is perfect for you! Is TESL Canada Accreditation Only for Canadians? TESL Canada accreditation is not only for Canadians! Native speakers from Canada, USA, United Kingdom, Ireland, Australia, New Zealand, and South Africa are eligible for TESL Canada accreditation. Non-native English speakers must obtain a valid proficiency score (TOEFL or IELTS) before applying for TESL Canada accreditation. How Does TESL Canada Compare to CELTA? A 120-hour TESOL certificate course that is recognized by TESL Canada for their Standard 1 certification is academically equivalent to the 120-hour CELTA certification course. 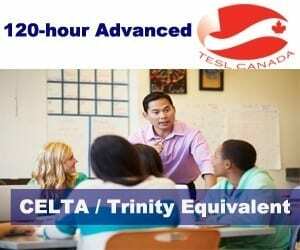 A 250-hour TESOL Diploma program that is recognized by TESL Canada for their Standard 2 certification provides more training than a CELTA course. Do I need TESL Canada Standard 1 Before Pursuing TESL Canada Standard 2? No, you don’t need to get TESL Canada Standard 1 to pursue Standard 2 certification. You can get the best level of training from the beginning to be better prepared for career advancement opportunities. Is There a Deadline to Complete the Practicum? There isn’t a deadline to complete the separate Practicum module. You can take the online course and receive the TESOL certificate issued by Coventry House International-OnTESOL. When you complete the Practicum, we will issue a new certificate with Practicum. You can take the Practicum in Canada or abroad. Does the TESL Canada Certificate Ever Expire? No, your TESL Canada certificate will never expire. Accredited course providers must renew their accreditation every 5 years. Even if the course is not offered any more because the institute goes out of business or gets the accreditation removed, your TESL Canada certificate will remain valid. Qualify for TESL Canada Certification Online with OnTESOL! The 250-hour TESOL Diploma is the best program for people who want to pursue a career in Teaching English to Speakers of Other Languages (TESOL). Study online from anywhere in the world. Teaching experience is not required. Take a TESOL certification course that is recognized in Canada and abroad. Get advanced TESOL training with OnTESOL. This program is academically equivalent to CELTA and Trinity CertTESOL.